A Giga Zaur in Tokyo City…. 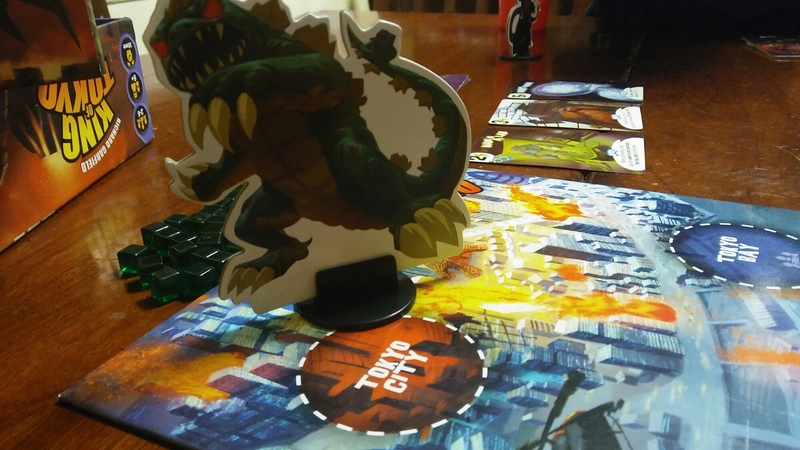 You will find the Giga Zaur in the great family game King of Tokyo, designed by Richard Garfield and produced by Iello Games. In this game, my daughter was Giga Zaur and she was taking the mayhem to Tokyo City. This Yahtzee style game is great for the whole family. Even my 4 year old loves to play…with some help. What kid doesn’t like taking a giant monster and attacking their parents…..yes, my wife and I are usually the first to be destroyed! Rules are simple and quick to teach, and turns go fairly fast. It’s a great fast, fun, light game for the whole family….and not too bad for a game group either to start a game night or end one. Previous Previous post: 12 Days of Christmas Gaming (2016): 5 Gold Ingots! I sit next to you in church and have heard you sing. I really want to hear you sing this song when you are done posting all 12 of the entries. Maybe we could shoot a video and see how many views it will get? Maybe I can join in?